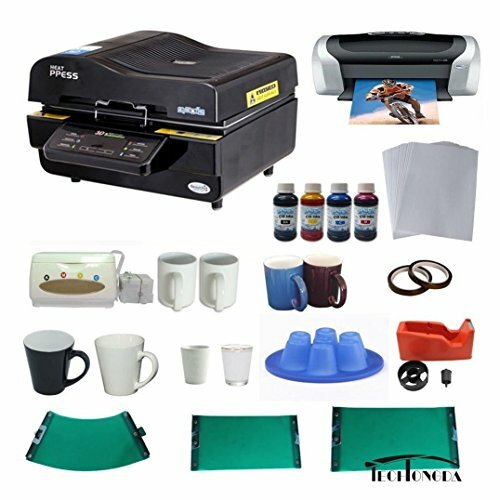 This package include ALL the items for 3D sublimation heat press!!! This package include all the items for 3D sublimation press!! !3D Sublimation machine is all-in-one machine, can transfer many sublimation blanks, mug, latte mug, plate, hat, t-shirt, iphone/ipad case, metal, glass, crystal. Epson C88 printer and CISS 88, the high-performance Epson Stylus ® C88 speeds through critical projects and reports, delivering amazing quality and durability with DURABrite® Ultra inks. Short Wine Glasses transfer, can be used by 3D Sublimation transfer machine. It can print 1.5oz short wine glass. White mug, Full-Color Changing Sublimation Mug, Coated Latte Mugs,Glass Latte Mug, Heat tape and Tape holder.